We are getting ready to say farewell to some dear friends. Thomas and Gordon and Percy and Lady and Edward and Ben and Cranky and so on. These wooden train toys have been well loved and much played with for the last 8 (!) years, and the family has grown from the first set brought by Santa when Teddy was 3, to the new trains that arrived every Christmas and birthday until Barley decided he was too old for Thomas a couple of years ago. We recently pulled them out from the coat closet where they have languished, unplayed with and unmissed. DH arranged, stacked and photographed them in anticipation of their debut on EBay in time for the Christmas rush. If we can get the price we want, then maybe the boys will not be too old for a visit from Santa this year after all. And yet, I am really sad about their imminent departure. 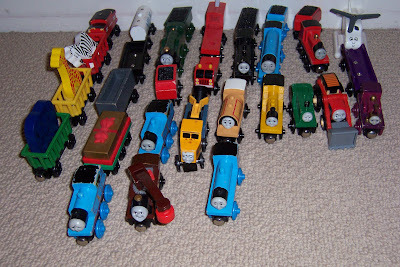 The Thomas era is over (the boys briefly flirted with that era by setting up a humongous track in the living room after DH was done cataloging). I remember very clearly when the Thomas era began in our home. It was 8 years ago almost exactly. Teddy was approaching his 3rd birthday, and finally old enough to both articulate what he wanted for Christmas (THOMAS!!!) and to understand the concept of being good for Santa Claus. DH and I seized enthusiastically upon this ages old tool of parental manipulation. Teddy is, was, and has always been a very ENERGETIC boy. We thought of having him tested for ADHD many times, and finally did last year (close, but not quite). We were desperate for ways of curbing his...enthusiasm, shall we say? "Be good, Santa's watching" or "What do you think Santa would say about how well you are listening right now?" became our mantras, and they worked well. Teddy's spiral of hyperactivity would wind down instead of continuing to ratchet up. Brilliant--what a GREAT development we thought, as DH and I congratulated ourselves on our excellent parenting technique. Until the day Teddy woke up from his afternoon nap SCREAMING AT THE TOP OF HIS LUNGS. We didn't see any obvious trauma, but after coming running from other parts of the house to comfort our distraught child, our hearts were beating a tempo to match his. It took him a long time to calm down enough to tell us what was wrong. It felt like 20 minutes, but it was probably only 10. Between ragged breaths, he gasped out, one horrified word at a time, "I...dreamed....that (breath)...I...saw ...(breathe)...Santa.........and he ... told...me...(gasp...more crying)....he's not going to give me Thomas....because I've been too BAD!..(WAILING)..." DH and were both horrified. What had we done to our precious baby to give him nightmares about a vengeful evil Santa?!?!?!? Might we have been playing the only card in our discipline hand too often? Teddy was not a mean child, or purposely disobedient--just high-spirited. We felt terrible. And no matter how much we tried to tell Teddy how much we loved him, and how good he was, and Santa couldn't possibly think he was bad, he was upset and depressed for a long time after this incident. Of course, Santa did come through for Teddy that year. He came through BIG. Teddy was very merry indeed on Christmas morning. This experience does, of course, give me pause as we introduce our boys to the omnipotent and omnipresent Christian God. As the years have passed, and we added more parenting experience to our resumes, part of me sees that perhaps that nightmare was not just a judgment on our discipline style. Teddy himself may have been harboring some guilt for his own knowledge of just how hard he was, or perhaps was not, trying to be good and listen. So I am ready to say good-bye to Thomas, and all the guilt that went with that memory. But I'll also always remember just how much he meant to Teddy, that his 3-year old deity made a personal appearance in his sleep to discuss his behavior. Thomas, you've been a big part of our family. I'll miss you. That memory feels like it was yesterday for me, too. I do find it interesting that the one train we can't seem to locate--the one who is eluding the imminent purge--is Diesel, the naughtiest of the train characters. Diesel had a "big grabby thing" (as it was known by the boys) on his roof and was always very menacing indeed. 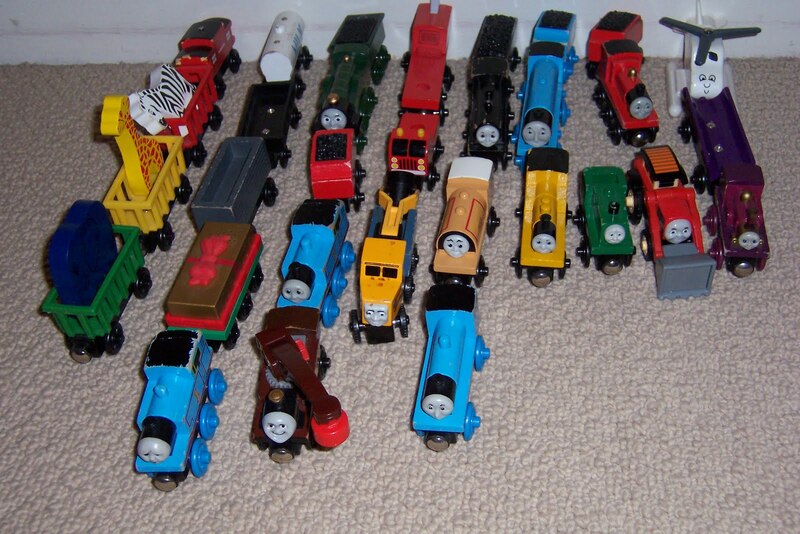 So I have an image in my mind of Diesel simply refusing to play by the rules and leave with the rest of the trains. I'm sure he'll show up just after the others have been shipped off, just to remind us of his cleverness!